A Trillion Here, A Trillion There; Models Matter; A Problem With Prosperity; Days Of Disruption: Hollywood; Econ Recon | SBS Consulting Inc. 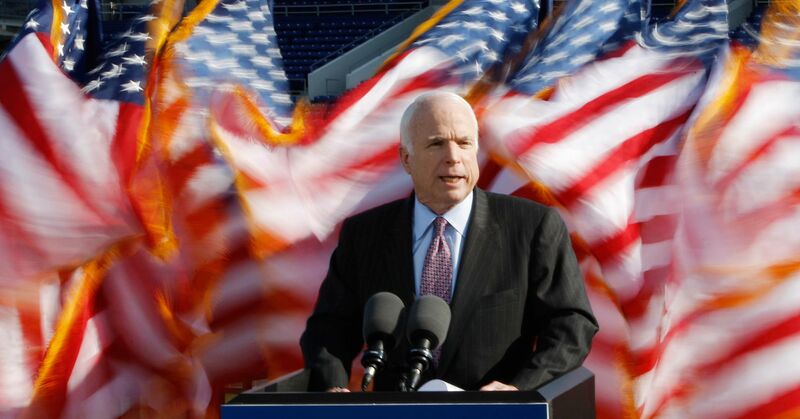 Upon his retirement from the Navy in 1981, Captain McCain’s awards included the Silver Star, Legion of Merit with Combat V and one gold star, Distinguished Flying Cross, the Bronze Star with Combat V and two gold stars, and the Purple Heart with one gold star. In my view his defining moment came when the North Vietnamese offered him early release (because of who his father was) as a propaganda ploy. Despite having suffered extraordinary torture and deprivation already, McCain refused release, adhering steadfastly to the Code of Conduct, knowing that it would have a severe adverse effect on the morale of those POW’s left behind, and knowing full well that his refusal would lead to additional torture, which it most certainly did. His extraordinary example of “service with honor” under the most difficult circumstances was an inspiration to me, and I know to very many others. The late Illinois Senator Everett Dirksen is reputed to have characterized the “Great Society” fiscal policy of the 1960s with the wry observation that “A billion here, a billion there….and after a while it adds up to real money.” Fifty years later we add a few zeros and we’re talking trillions. Were it just the Federal Government’s climbing debt and ongoing deficits, that would be scary enough. But before the main event of Federal meltdown manifests itself, the opening act will be the ballooning pension and healthcare obligations of teachers, first responders and other state and local obligations. Decades ago these employees traded lower current income for a state guaranteed retirement. Mismanagement of these pension plans has resulted in a funding deficit which, it is estimated, to be approximately $ 4.4 trillion. This may be the defining issue of our times as it will affect everyone, either as a retiree or as a younger member of the workforce paying increased taxes to make up the shortfall. An executive summary of the situation in the Knowledge@Wharton newsletter explains the limited and painful options for remedying this situation. None of them are good. Most involve more taxes, especially on real estate, and cuts in other government services. Coupled with an aging population that is living longer we have a “Time Bomb Inside the Public Pension Plans” Want to know what your share of the shortfall might be? Read the article. It may well be more than you have already put aside. “Happy families are all alike; every unhappy family is unhappy in its own way” wrote the Russian novelist Tolstoy. The same seems to be true for “happy” (and successful) businesses. Regardless of the nature of the product or service offered, the most successful companies today are based upon a healthy corporate culture and defined processes executed brilliantly, usually in some sort of software system. But no competitive advantage lasts forever. What comes after being process driven? This article from the WSJ suggests that it will be “models”; data driven continuous learning models to be exact. Find out why, sooner rather than later, Models Will Run the World. Find out what a “model” really is…..and the risks of not being one. There are no unmixed blessings; and this long economic expansion not only makes profit possible, but also makes it more difficult to maintain as the competition for resources heats up and inflation again raises its ugly head. In an INC Magazine article, Vistage Chief Research Officer Joe Galvin offers four tactics to keep high costs from consuming your company’s profits. The Direct-To-Consumer model of movie and TV delivery, according to one Hollywood observer, “marks the biggest shift in entertainment industry economics in decades, and it is an evolution largely driven by a company that has been in the original content business for barely six years”; namely Netflix. Most of us are aware that Netflix came out of nowhere to become the bane of Hollywood’s existence but a recent executive summary in Variety of the dynamics of disruption bedeviling the entertainment business is worth a few moments of your time, not only because it impacts how you consume entertainment, but offers some valuable insights on the nature of disruption that may come in handy when a newcomer in your industry turns your business model on its head. Find out how Hollywood is Racing to Catch Up with Netflix. Wesbury vs. Will: This past week marked the longest bull market in US history and the coming year, absent a recession, marks the longest economic expansion on record. But nothing lasts forever. Columnist George Will, best known for this thoughts on politics and baseball, recently warned that “Another Epic Economic Collapse is Coming.” Dr. Brian Wesbury begs to differ. While allowing that the business cycle has not been outlawed, he remains an optimist. Read Mr. Will’s column and then watch Dr. Wesbury’s most recent Wesbury 101 video in response.